The Catholic Church calendar marks 14 September each year to celebrate the Triumph of the Cross. This most ignominious sign of shame and disgrace in the age of the Roman Empire is probably the most misunderstood and under-appreciated display of God’s inside-out and upside-down approach towards enlightenment, actualization and salvation. It didn’t take much (and still doesn’t) for people to reject any notions of cross-carrying in life. Yet, Jesus couldn’t make it clearer that all serious followers of his had to renounce the self, and then take up his or her cross, and then follow Jesus. In other words, there is no cheap and easy discipleship. Each determined step of being a disciple of Jesus requires an honest apprehension and cognizance of what one finds most difficult to live life the way Christ wants us to. Perhaps for this reason alone, Christianity can never be called an escapism from life simply because Jesus makes it clear that it is most likely the very things that we run away from, hide from and find most shameful and embarrassing that will end up saving us, because we choose the very difficult option of admitting of our absolutely powerlessness over them on our own, and take them resolutely with us with the strength that comes from Christ. It’s not that he will condone them, or rationalize them for us, but the very wisdom of God is often shown when our greatest failures become our greatest strengths. This truth is very much in line with a lot of teachings that have a spiritual background. It is found in the paradoxes that cannot be understood or comprehended from a mind that uses pure logic and intuition. That is why Jesus had always spoken of the need for a conversion – a metanoia in the minds of his disciples, because it requires very much of any serious disciple to apprehend reality with a different mind which is ‘beyond’ the mind. In the Catholic tradition, when a priest blesses with the Cross, there is a lot in that one simple action. That the Church chooses to use this instrument of torture and shame to ‘bless’ us in any assembly says a lot more than meets the eye. It reminds us that our own crosses in life can truly be our hidden blessings if we but use them toward our sanctification. It would seem illogical that our failures and hardships and weaknesses can ‘bless’ us, but this is what the Cross on Calvary boldly showed to be true. When I bless Crosses for the lay faithful, or when I bless them with a Cross, my prayer is always that the person never runs away from their crosses, their fears and their weaknesses in life. My heartfelt prayer is that they take courage to face their challenges in life, whatever they may be, because this is the hidden wisdom behind the triumph of the Cross. But much as I try to impart this through the prayers I formulate, I get a sense that oftentimes, the person much prefers to use the cross as a means to keep at bay (or at least at a comfortable distance) the things that make living both a challenge and a struggle. Using the Cross as a sort of a talisman to ward off evil will hardly lead one to living a transformed life, if one does not heed Jesus’ advice to take up one’s cross and follow him. At home we have a picture of the agony in the garden. Jesus has His eyes raised to heaven, his hands clasped in prayer.... The moon shrouded in clouds in the distance. People have often said what a peaceful scene it is....The whole picture is in shades of one colour which probably adds to this idea of serenity. For me it must mark the point that Jesus surrendered His will to the Father. The constant Son, obedient unto death a contrast to the changeable moon..
““Abba, Father,” he said, “everything is possible for you. Take this cup from me.....” and later ““My soul is overwhelmed with sorrow to the point of death,” so before the point of surrender and acceptance “Yet not what I will, but what you will” there was all this turmoil and anguish. Thank you for praying for us that we will never run away from our crosses, our fears and our weaknesses in life. Thank you for your heartfelt prayer that we will take courage to face our challenges in life, whatever they may be, because this is the hidden wisdom behind the triumph of the Cross. 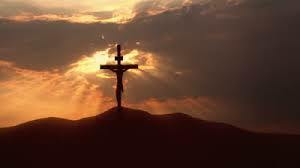 Indeed the Cross is a sign of victory over sins, faults, failures and death. Knowing this provides me with much comfort that God is with me and that ultimately, I will overcome all my adversities with God's grace and strength. If He can do it, so can I. Jesus is our great model of faith, love, complete trust and surrender to God. Hence, I am not alone. We were taught from young in our catechism classes, to reverence the cross as the symbol of God’s love for man. Thinking about this, I was suddenly reminded of our literature class in Sec 2 where we were truly enthralled by the moving story of Sydney Carton’s self-sacrificing love in A Tale of Two Cities. Most of the class were in tears at the end of the story for though he was a rascal of sorts (a sinner, definitely) we were won over by the purity of his love which made him take the place of his lady-love’s lover at the guillotine- in the period of the French Revolution. Reflecting further made me realize that this character was more endearing, more unforgettable than the upright, noble Marquis because love was at the heart of the matter. Though our minds were too young to truly comprehend the profundity of self-sacrificing love, yet the heart gets the message. So it is also true for us Christians today when we gaze upon the cross. To consider the cross as the ‘saving love of God’ requires not a disciple’s intellectual capability or his achieved intellectual level – but rather it needs a mind which is beyond ‘mind’ (as you have said) - it depends on the disciple’s current status or relationship with God. In short, his mind and his heart has to be equally engaged in the things of God. If one’s mind is enmeshed in the thinking of the world, one will consider the cross a folly, something preposterous or scandalous. However, for one who has been given the mind of God or graced by Love then the cross is the epitome of God’s power – a mystery of divine love – the only hope of fallen humanity. I have recently finished, by now one of my favourite DVD study, on St. Peter, where I was introduced to “Quo Vadis”. The legend among the first believers that as Peter was fleeing from likely crucifixion in Rome at the hands of the government under Nero, and along the road outside the city he meets the risen Jesus. In the Latin translation, Peter asks Jesus "Quo vadis? ", to which Jesus replies, "Romam eo iterum crucifigi" ("I am going to Rome to be crucified again") - if Peter desert the people (his cross)...) Peter thereby gains the courage to continue his ministry and returns to the city, to eventually be martyred by being crucified upside-down. The Church of Domine Quo Vadis in Rome is built where, according to legend, the meeting between Peter and Jesus took place. I take much comfort in St Peter, that being such a human in err, I can so often relate with him. We can be beaten, but God will never let us stay down. Indeed, none of us can escape our crosses, no matter how far & wide we run to avoid it… this is the real deal of discipleship. To bravely face and to bear our heavy crosses, in love and trust - God will use our efforts to make it redemptive. As He did on Calvary, He showed us the route to follow. The Way of Life. There is no victory without our crosses. PS: Fr., please correct me if I am wrong - as I was reflecting on our Blessed Mother on her feast of Sorrows yesterday, I wondered if it may not be mere coincidence to commemorate this feast right after Triumph of the Cross? Mother Mary, too, must have triumphed over her cross of sorrows... being immaculately conceived, she therefore, perfect in love, loves till it hurts… as a sword pierces through. It must have been so painful seeing your loved ones in pain, not understanding why and mayhaps wishing for roles reversal, yet in faith, trusted. Hope you are keeping well in the haze.